Wizards of the Coast is announcing at GenCon today that it will release the 4th Edition of its category-leading Dungeons and Dragon roleplaying game in 2008, the first full new edition in eight years. The three core books will be released next summer on a monthly schedule: Player's Handbook in May, Monster Manual in June, and Dungeon Master's Guide in July. Pricing and page counts of the new products will be consistent with current packaging. Graphics have been updated, art will be used on the covers, and interior design has been opened up to make the books less intimidating to new players. Lead-in products, Wizards Presents: Classes and Races and Wizards Presents: Worlds and Monsters, will be released in December. An April release, Keep of the Shadowfell, will include a set of quickstart rules for 4E. While there are changes in play (such as incorporating 'epic-level play,' with 30 levels instead of 20), they are described as 'evolutionary' rather than 'revolutionary.' Other changes include new power sources, changes in resource management, and new encounter design, and more clearly defined monster roles. Changes will speed play, make the game easier to learn, and make DM-ing easier. Concepts for 4th Edition gameplay were tested in the new Star Wars RPG, and the Book of 9 Swords. What the company does describe as revolutionary is the method of product delivery, which will incorporate online play for the first time. WotC is incorporating online components into the game through a new Website, DnDInsider.com. Each paper product will include codes to unlock digital versions on the site for a 'nominal' activation fee. Players will also be able to use DnDInsider tools and access regular new content similar to the material that was previously released in Dragon and Dungeon magazines (see 'Interview with Liz Schuh') for a monthly fee (as yet undetermined) greater than the old subscription price, but less than a MMORPG subscription. Magazine-style content will be added to the site three times a week and compiled into digital 'issues' monthly. Gameplay features on the Web will include a digital D&D game table, and voice chat and text messaging, to allow online players to communicate with each other. The online play is designed to 'supplement, not replace' meatspace play. The Open Gaming License will continue as it has in the past, allowing the use of the rules in other publishers' games. Work on the new edition began in 2005, with the major work all accomplished in the last year. D&D products released between now and the launch of 4th Edition will fall into three groups. Edition-proof products (which are mostly story) will not include mechanics that are edition-specific. Some products will be 'enhanced' to 4th Edition mechanics after release through DnDInsider, and a couple of series will end as 3.5 products. The setting for the core books are campaign neutral. 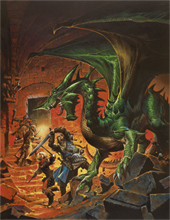 Forgotten Realms will be the first campaign setting to be updated (in August 2008). Other campaign settings will be updated at a rate of one per year. Marketing support will initially focus on migrating the existing player base, and then move to an acquisition strategy to re-activate lapsed players and acquire new ones. Midnight launch parties will be used to kick off sales of the first new release in May.